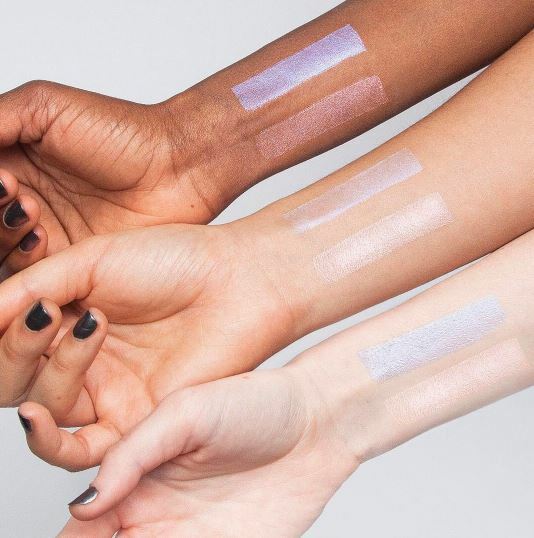 Milk Makeup is releasing a new shade of their famous Holographic Highlighter Stick on Tuesday, 5.02! This new shade is called Mars and it will be available both on Milk’s website and Sephora for $28! The first shade of this product was a bit more on the lavender side while this one has a very clear goldy-pinkk iridescence to it. This will totally make this one more wearable for most people as it applies a bit more subtly and, therefore, appears slightly more natural. Now keep in mind, this does come in stick form, which can certainly be handy in terms of convenience & travel but it can be slightly tricky when it comes to application – if you don’t have any makeup on yet, you’re GOOD! You can rub the stick right along the cheek bones (or wherever else you want to POP) and then proceed as normal. However, of you’ve already applied your base, you’ll likely need to rub some of the product off on your finger or a brush and apply it that way as rubbing the stick directly over other products can potentially disrupt the work you’ve already done! Just a pro tip for ya. It’s also not like the other highlighters we’ve covered recently (nice, right?) in that it sits on the more subtle side of things – that can be great for those of us that roll natural but if you want to GLOWWWWW to the moon (or Mars ;)) this may not be your cup of tea. Lucky @Victoria Lyn & my girl @BaileyB got her hands on the new highlighter early so we’ve added both of their videos below! Definitely check them out so see this baby in action! I so need to try this! P.S. I see those impress nails!! I just did a how-to tutorial on you-tube for those! I just put that exact design on this week too! LOVE THEM!! Great post!